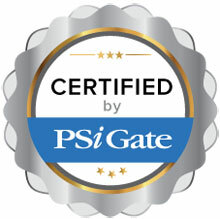 The Mal’s Ecommerce shopping cart is fully certified to integrate with PSiGate’s payment processing gateway. This certified solution works in both Canadian and US dollars. Visa, MasterCard and American express credit card processing is available. Please note that some features are only accessible through the PSiGate online web interface and not through Mal’s Ecommerce. Add our simple Buy Now buttons beside the products on your website. When a customer clicks on one of these buttons, they are taken to their shopping cart which is hosted on our servers. Here they can choose to edit their order, continue shopping or move on to the payments section.